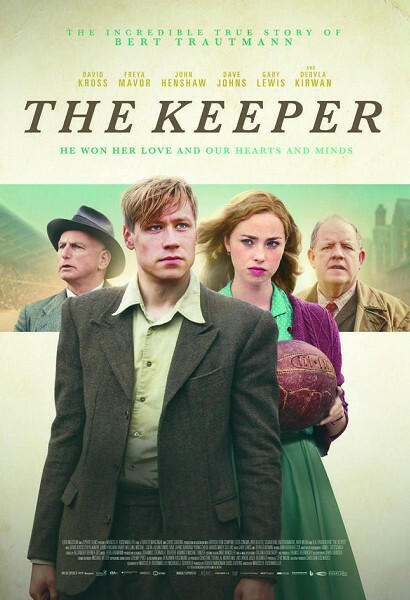 Marcus H. Rosenmüller’s rousing biographical film charts the career of Bert Trautmann (David Kross - The Reader) as he moves from German prisoner of war to secure the position of Goalkeeper at Manchester City, against a backdrop of British post-war protest and prejudice, and in doing so becomes a footballing icon. Struggling for acceptance by those who dismiss him as the enemy, Bert's love for Margaret (Freya Mavor), an Englishwoman, carries him through and he wins over even his harshest opponents by winning the 1956 FA Cup Final. Incredibly, he played the last 17 minutes with a broken neck to secure their victory. Kross delivers a humble and charming portrayal of the football legend, while John Henshaw gives a typically excellent performance as Jack Friar, Margaret’s plain-speaking dad. Henshaw also received a script credit for his efforts to ensure that the English dialogue of the German-speaking screenwriters sounded properly Lancashire.